This healthy vegan quinoa porridge is just one of many great ways to enjoy quinoa for breakfast. It's a vegetarian recipe made with the ancient grain — pronounced "kween-wah" — cooked either in soy milk or almond milk, with a bit of brown sugar and vanilla and cinnamon for flavor. Top it off with fresh fruit and nuts of your choice. Quinoa is one of the few vegetarian sources of complete protein, as well as a good source of fiber and antioxidants. It's also naturally gluten-free, making it a better option for people who are gluten intolerant or have celiac disease. If you use quinoa for making dishes for lunch or dinner, you can make a little extra cooked quinoa and use it in this breakfast recipe. It's also a great way to use up leftover quinoa when you didn't mean to make extra! Combine quinoa and soy or almond milk in a saucepan. Cook over low heat, stirring occasionally, for about 10 minutes. Add brown sugar, cinnamon and vanilla and heat for another 5 to 6 minutes, until quinoa is soft. Stir in strawberries and any extra healthy toppings. Recipes such as this one are a great reason to keep some leftover quinoa on hand. If you have leftover quinoa, just reheat it stove top with about 1/3 cup soy milk or other non-dairy milk until it's nice and hot, then add the remaining ingredients. This recipe makes two servings. If you don't want to enjoy it all at once, set half of it aside before adding the fruit and nuts at the last step. Refrigerate it and use it the next day or later in the week, adding a little extra non-dairy milk to adjust the consistency. You can heat it in the microwave or on the stovetop. Though the recipe suggests strawberries with pecans or hazelnuts, you can obviously swap these out for any combination of fruits, nuts or other healthy toppings you'd like. Try hemp seeds or perhaps some raw vegan cacao nibs for a sweet morning treat with a bit of a crunch. Add in a bit of your favorite vegan protein powder for even more protein. All of the grunt work here goes into cooking the quinoa in a little milk, From there, it really is a blank canvas you can use to add your favorite breakfast flavor combinations. How about peanut butter and chocolate breakfast quinoa, or chocolate and banana breakfast quinoa? Those should please both children and adults. Of course, there is maple, banana, raisin, and cinnamon breakfast quinoa to hit all of the traditional flavors. 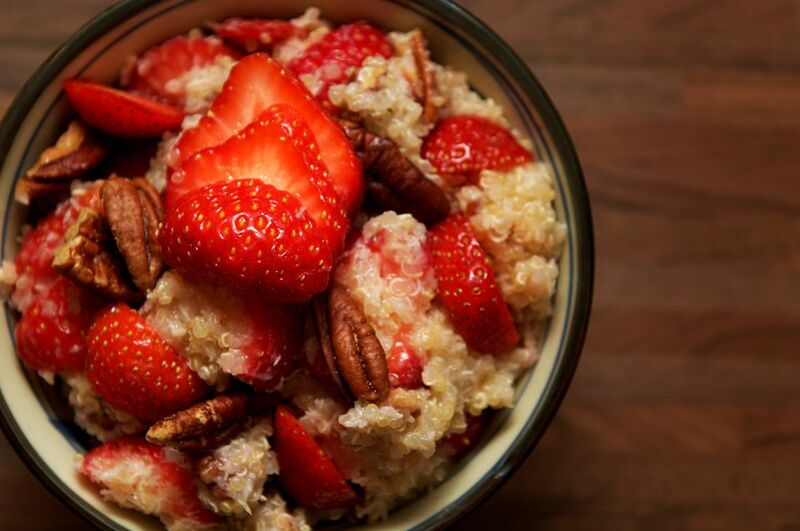 Replace the quinoa with steel-cut oats for an oatmeal version of this recipe. Cook the oats for about 30 minutes, until they've reached the desired consistency.